One of my favorite things to do with winter vegetables like beets and winter squash–both of which take a while to roast–is to roast big panfuls to have on hand for any number of savory or sweet uses. Since the roasting is basically unattended you can do it while you’re in the kitchen making something else for dinner or whenever you happen to be home for a bit or your oven is already on. It then seems like such a coup to have those sweet, tender chunks of goodness in your fridge whenever you want them. I think of this as another element in my prepared pantry. A term I use to describe all those things (veggie bouillon, cooked, frozen beans, etc.) that enable you to make fast food with real, wonderful ingredients. I think I’ll devote a whole post to this concept one of these days. And as a matter of fact, some of my upcoming classes–Pantry Stocking & Quick Meals and Kitchen Confidence: Techniques & Tools, Variations & Combinations–focus on just such things. Sometimes I don’t even manage to make them squash or beets into anything but just snack on them or serve them as a side with good olive oil and salt and a drizzle of sherry vinegar for the beets. But often they go into salads or a risotto or soup or curry. The other day I had a bunch of roasted squash in the fridge as well as a partial can of coconut milk which I knew wouldn’t last much longer. So out of these two items these muffins were born. The coarse sugar and toasted coconut make for a nice, crunchy topping. Don't skip this part--it really adds and you use more of the coconut in the batter it anyway. The bake-with-what-you-have strategy does not always work but this time it did and I will open a new can of coconut milk and roast squash for just this purpose in the future. I added some chopped golden raisins (whole my son picks them out but chopped he doesn’t mind them) for sweetness, a bunch of fresh, grated ginger and some toasted shredded coconut. Next time I’m going to try adding some lime or lemon zest just for fun but there already is plenty going on in these. And in the bake-with-what-you-have vein, I’m sure these would be good with nuts instead of raisins or other dried fruit or different sweeteners so play around and let me know how it goes. 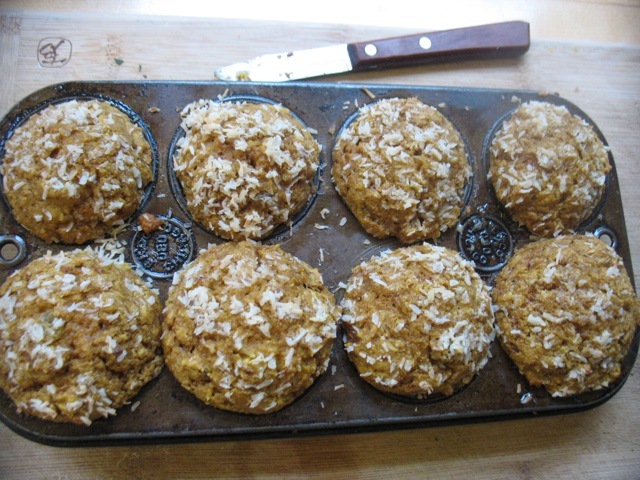 These muffins keep quite well since the squash keeps them moist. These muffins are not very sweet so up the sweetener a bit if you’d like. And the sweetness will also depend on the kind of squash you use. I used buttercup and would recommend it, kabocha, hubbard or butternut. You want a dense, dry-ish fleshed, sweet squash. But then again, use whatever you have and see how it goes! Preheat oven to 375. While it’s heating spread the shredded, unsweetened coconut on a sheet pan and toast until just beginning to turn golden. This can take anywhere from 5- 10 minutes. Check often and be careful not to burn. Put the squash, eggs, ginger, coconut milk and vanilla in a blender or food processor and process until smooth. Alternatively you can mash the squash with a fork (it should be nice and soft and easy to do) and then whisk all the wet ingredients together by hand. Whisk the flours, sugar, baking soda, baking powder, cinnamon, and salt together in a large bowl. Add the squash coconut milk mixture, the raisins and toasted coconut (be sure to reserve 3 tablespoons for the topping) and stir until just combined. Don’t over mix. 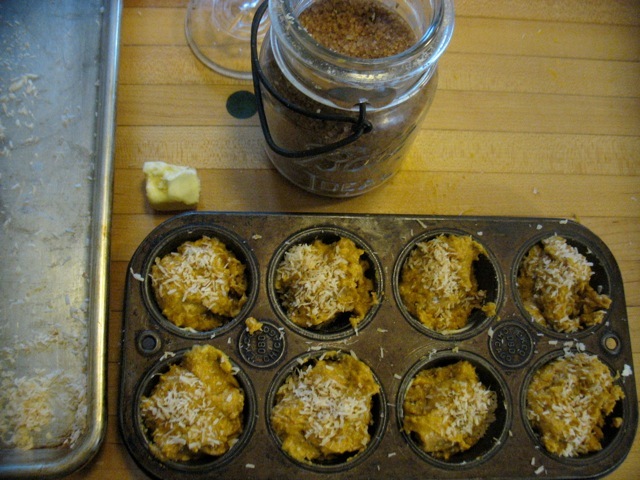 Portion the batter into muffin tins, filling each one about 3/4 full. 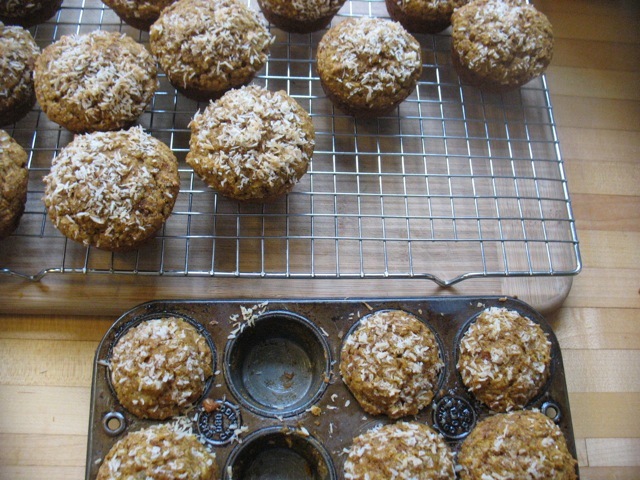 Sprinkle each unbaked muffin with the coarse sugar and toasted coconut, lightly pressing down on the topping so it sticks well. Bake for about 15 – 18 minutes or until a tester comes out clean. Report back if you do. You could go triple coconut with these: sugar, milk and flour! :) Probably mixed with some other gf flour too though. These sound very yummy! I make a sweet potato muffin, and it seems to me that sweet potato would be a good stand in for the squash as well. I was planning on making these with some mystery squash from the freezer that appeared to be roasted already. But I realized as it defrosted that it has onions and garlic mixed in. So instead I threw in 2+ overripe bananas in place of the squash. I was kind of worried that the banana would overpower the coconut – I love toasted coconut – but that flavor was still strong with the banana. Plus, banana + coconut makes me feel like I’m in the tropics, instead of sitting in my Maine kitchen waiting for a snowstorm. I’ll take what I can get this time of year! I also didn’t realize there is no oil or butter until after I made it and ate it. Great recipe! Love that it adapts so well. Thanks for sharing. Thanks for the report Maryann. Banana sounds perfect in these. I’m so glad it adapted well and hope the oniony squash found a good purpose too.